Hi lovelies! Recently, I've been revamping my bedroom a little, I'd had the same wardrobes and drawers for years so they desperately needed replacing! So, I've now got this gorgeous wardrobe, chest of drawers and bedside table (all linked) from IKEA. I don't know about you guys, but there's something about re-organizing things that makes me feel really chilled out (not while sorting through all my crap though, that was stresful! ), it's strange, but clearing out all the clutter and having everything all neat, tidy and organized makes me feel so much more relaxed. As you can see from the little snippets of my room, I'm trying to keep everything super simple and minimal and I'm hoping to keep it that way! My bedroom is fairly small, so I try to make the most of the space by keeping as much as I can away in drawers and cupboards rather than all over the floor! It's a good thing I still live with my parents and have a room to myself, I don't know how I'll cope sharing with a boy when I eventually move out with my boyfriend Darren, he may just have to put up with the pink I think. 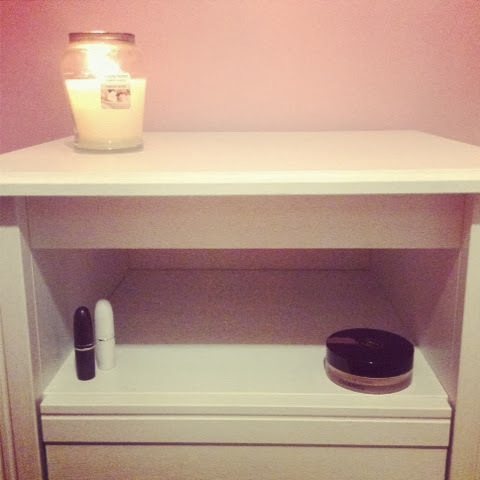 I'm still looking for little touches to perfect the room, in particular the chest of drawers, I love having the little bits of makeup and candle, but I think maybe it needs something else. I think fresh flowers would look lovely, but would need replacing often (Darren, if you're reading...), let me know what you think as I'd love your opinions! Also, if you have any favourite candles, definitely leave me a comment as I get a bit obsessed with candles as the winter approaches. What do you think? Do you like to keep your room nice and organized? And if so, do you have any organization tips? Let me know! I try to keep my room as organised as possible. Our house is on the market so I need to 'declutter' for viewings etc and keep hiding things and loosing them. Oops. I love your bedside table! 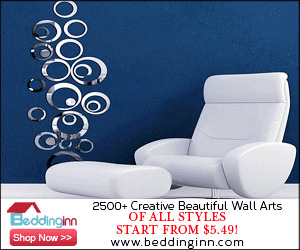 I'd love to redecorate but I really can't afford to. I love the white furniture though, it looks lovely! Very nice and tidy!! :) I hate a messy bedroom:L haha!! love your new pieces! i feel the best when my room is all tidied and i have a candle burning! Whenever my room is more tidy I feel more productive for some reason. Can't beat Ikea for bits like that, my entire room looks like a Ikea showroom! I really like the white, looks very clean. 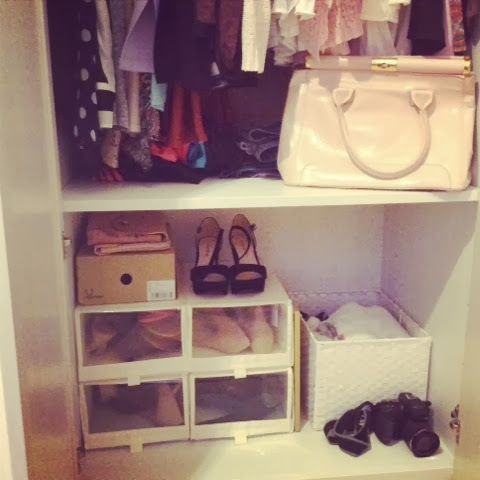 I would love to have a wardrobe like this but I already have a built in closet (which I totally would give up so I can just have a nice looking wardrobe-is that weird!? :p). Also, what is that white lipstick? I really have too much stuff to keep my flat organised. Lovely room, I love how simple it is and I love being tidy it just feels so good! My room being a tip drives me insane! At the minute my family are in the middle of a very delayed move, so half my room is in boxes and I don't know what I can do with anything. STRESS. So jealous of your room right now! Looks great! I need to get some shoe boxes like that mine are all in a right mess. I love the minimalistic approach, it all looks so cute!